A mambo jazz descarga recording heavily influenced by the Cuban descargas of the time (the time being early 1960s?). Line up includes trumpets, saxophone, timbales, vocals, conga, bongo etc. Plenty of solos and up front brass arrangements. 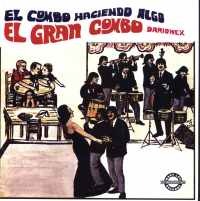 New York based El Gran Combo Darionex are no more but their jamming mambo jazz lives on in this recording.